Know a man by his ancestry, his friends, his enemies… and his books. William Wake’s ancestry included the quarrelsome and rebellious Hereward the Wake; several members of the clergy; a book thief (who is also to be counted in the previous class of persons in this list); a father who was in prison when he was born; and a mother who by cleverness and hard work managed to restore the family fortunes. Between his friends he could count a wife with Archbishop Chichele’s blood in her veins; several Bishops and Archbishops, and half of the clergy in England; French Huguenots and expatriates; writers and publishers; and the Prince and Princess of Wales (unfortunately, not the King). As for his enemies, the Government and the other half of the clergy are the most conspicuous. Tracing the character of William Wake (1657-1737, Archbishop of Canterbury from 1716) through the books he collected during his life has been an interesting and rewarding exercise. Wake’s books have stories to tell about the schoolboy, the scholar, and the man of power, but also the father and the husband; they shed light on his habits and reveal him to us as a hoarder; their bindings talk about his travels and his fortunes; and they teach us about his ancestry, friends and enemies. 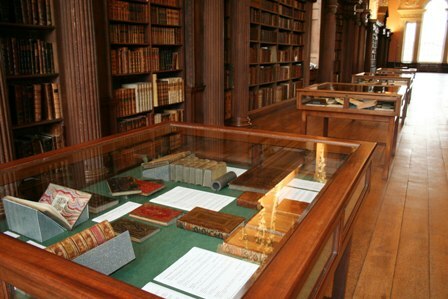 Christ Church Upper Library exhibition WAKE is a celebration of the conclusion of the cataloguing of the over 7000 early printed books in the Wake Collection. Work began in-house in 1995, and after a break between 2003 and 2005, was continued until completion, on Friday 26th February 2010, through participation in the Early Printed Books cataloguing project of the Bodleian Library. The records are accessible via OLIS, the Oxford University integrated online catalogue. The exhibition will be open between 28 April-28 May 2010. Next Next post: Picture this….